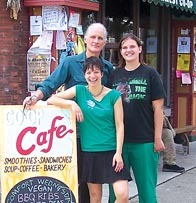 Riverwest Co-op Grocery & Café by Lisa Knapp, Photo Vince Bushell, Mary front, Doug and Shelly Since the Riverwest Co-op Grocery & Café has been open, they have worked to become a staple in our community. Starting as just a small neighborhood grocery buying club, they have proved both the success and importance of local business since opening doors to the public in 2001. Currently the Riverwest Co-op, eight years strong, provides our community with a variety of quality grocery goods and deliciously healthy café fare. With the Co-op being primarily volunteer run and operated, they are able to live their motto, “Food for people, not for profit,” by keeping prices lower. Gibson Caldwell, Riverwest Co-op board member and volunteer coordinator, was able to elaborate a little more on the importance of keeping business local. One of the strongest things that keeps the Co-op running is the loyal client base. The Co-op makes a huge effort to meet each customer’s needs, be it by taking suggestions to stock a grocery item that they like, or by supporting a community organization that they are passionate about. Customers also enjoy returning to the inviting, friendly, social neighborhood atmosphere. Workers and volunteers of the Co-op strive to get to know members and customers, their names and what they do. Community involvement is another important aspect of the Riverwest Co-op. Many people who are involved with co-op are also involved in other community activities, which opens many doors for mutual support. The Co-op proudly supports many organizations with monetary or food donations and presence at an event. It is very important for them to support the local economy. Not only does the Co-op support other local organizations by donation, they support them by stocking their shelves with local products. Since the co-op is not profit driven, they have time to seek out local business products to sell in the store. Seasonally, the amount of local produce varies due to our climate. Next time you are in shopping, look at the produce list to see what is currently local in the bins. Many other local goods can be found there too. Some of the packaged dry goods, refrigerated food, and dairy products are from Wisconsin, and a lot from Milwaukee. All gift items in stock are made by local artists. The Co-op believes that small local farmers tend to use more sustainable practices than larger corporate farms. So by supporting those local farmers it is not just supporting the local economy, it is supporting the environment as well. Plus, they like to support businesses and farms with similar ethics and beliefs, and where better to look than local? To wrap things up, we asked Gibson what it is that makes the Riverwest Co-op unique. He said “It is a magical place.” I couldn’t have stated it any better.